Happy birthday, Judge Dredd! Get 25% off Case Files collections! Happy birthday, Judge Joseph Dredd! To celebrate his 42 years on the streets we're slashing the cost of catching up on the past four decades of future law! You can now get the law for less with 25% off print and digital copies of Judge Dredd: The Complete Case Files! For almost 15 years, the Case Files series has been reprinting every episode of Judge Dredd in chronological order. Created by John Wagner and Carlos Ezquerra in 1977, Judge Dredd is now one of the world's most recognisable comic book characters! Delve into the Case Files and experience the stories that formed one of Britain’s most iconic comic book characters, from classic stories as The Apocalypse War, Oz, and The Judge Child, to decade-spanning plotlines such as Democracy and Mechanismo! Also included in the sale are the copies of Judge Dredd: The Restricted Files, which compile one-off stories from annuals and specials, including incredible and often-overlooked work from British comics' greatest talents. And don't forget - any digital purchases made via the 2000 AD webshop can also be downloaded and read via the 2000 AD mobile apps, if you log in with the same Rebellion ID! Get 50% off collections in The 12 Days of Thargmas sale! Grab a half price 2000 AD bargain with new titles added every day! 'Tis a time of great festive joy - let your Christmas overflow with Thrill-power with THE 12 DAYS OF THARGMAS HALF PRICE SALE! There's 50% off selected titles in the 2000 AD webshop for the next 12 days - with new titles added each day to spend your Chrimbo cash on! We kick off with Scarlet Traces, the comic book sequels to HG Wells' The War of the Worlds by Ian Edginton and Matt "D'Israeli" Brooker! In the last years of the 19th Century, the Martians invaded England - but miraculously they were wiped out and God's Own Country survived! A decade later, the British Empire has rebuilt and expanded its influence using the alien technology that brought it to its knees. Captain Robert Autumn and his manservant, Archie Currie, investigate the disappearance of Archie’s niece and uncover the sinister conspiracy behind the empire’s power! And be sure to check back tomorrow for the new half price collections, which may or may not involved a certain hard-nosed crime-fighter! Up to 50% off in the Hallowe'en Price Slice! There's up to half off print and digital horror-tastic collections in the Hallowe'en sale on the 2000 AD webshop! From the horrors of undead superfiends to the nightmares stalking council estates, from killer planets to old-fashioned zombies - there's something for every dark and deviant taste in the 2000 AD Hallowe'en Price Slice! Get up to 50% off some of our most terrifying tomes as we mark the turning of the season with fresh-from-the-grave bargains that will delight every ghoul and wraith this side of the veil! Whether you're after non-temporal digital copies or prefer slices of dead tree, our sale brings you the best horror the Galaxy's Greatest Comic has to offer, including modern marvels such as Cradlegrave and Defoe alongside stone-cold classics such as Return to Armageddon and Necropolis. Up to 50% off in the Necropolis sale for Hallowe'en! Grab the 'Necropolis' bundle and enjoy discounts on Deadworld, Judge Death: My Name Is Death, Judge Death: Young Death, and Dark Justice! Judge Death and his evil heanchmen are back and they've taken over Mega-City One - but where is Judge Dredd?!?! Get one of the greatest Judge Dredd sagas in a single bundle as part of the 2000 AD Necropolis sale - just in time for Hallowe'en! For the first time you can get the Necropolis Bundle - that's John Wagner and Carlos Ezquerra's incredible Necropolis story in Judge Dredd: The Complete Case Files 14 AND the backstory with Wagner and John Ridgway's The Dead Man - all for a single price! That's the entirety of one of the key moments in Dredd history that's guarateed to chill and thrill you this scare season! Meanwhile get up to 50% off The Fall of Deadworld, Dark Justice, Judge Death: My Name is Death, and Judge Death: Young Death in the 2000 AD webshop! 50% off all Sláine titles! Celebrate 35 years of the Celtic barbarian with 50% off print and digital titles in the 2000 AD webshop! He’s sliced and diced and warp-spasmed his way through history for 35 years – and we didn't think it too many years to celebrate! Pat Mills and Angie Kincaid's Celtic barbarian, Sláine, celebrates his birthday this week and you can get 50% off all print and digital Sláine collections in the 2000 AD webshop! Don't forget that if you register on the 2000 AD webshop with the same details as the 2000 AD app then you can buy webshop sale items and download them straight through the app! With duplicitous dwarf Ukko and his favourite weapon – a stone axe called Brainbiter – by his side, Sláine is a combination of Robert E Howard’s Conan and the ancient Irish hero Cú Chulainn. 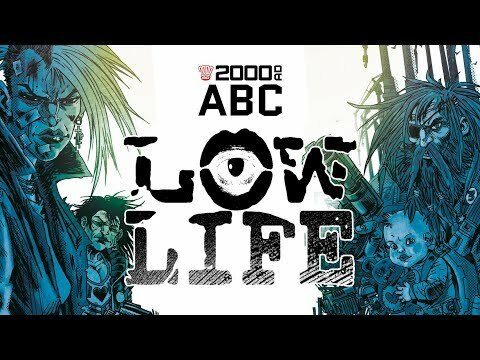 Headstrong, arrogant, brash, and not afraid to chop first and ask questions later, it is no exaggeration to say that, since his first adventure, Sláine MacRoth has become one of the mainstays of 2000 AD. Get up to 50% off Zenith collections! There's up to half off collections of Grant Morrison and Steve Yeowell's superpowered popstar! There's up to 50% off Zenith collections in the 2000 AD webshop until 21st August as we celebrate the superpowered superbrat's 31st birthday! Unfortunately for him and mankind, dark gods from another dimension known as the ‘Many-Angled Ones’ have sent Masterman’s twin to take over the planet and only Zenith and a small number of depowered heroes from the ‘Flower Power’ generation stand a chance of defeating him! The sale includes the Zenith Apex Edition - a full size reproduction of the original artwork from Phase One. Carefully hidden away by Yeowell for almost 30 years and curated by 2000 AD’s design team, the Apex Edition will be the closest readers can get to holding the original artwork in their hands – right down to seeing faded speech balloons pasted to the surface, editorial and design marks, and Yeowell’s brush and pen strokes! HAPPY BIRTHDAY ToBC! UP TO HALF PRICE off classic British comics! Celebrate an incredible year of reprints of classic comics from The Treasury of British Comics with up to 50% off collections! One year since Rebellion began bringing classic titles from the heyday of British comics back into print, The Treasury of British Comics is celebrating its first birthday with up to 50% off selected collections! Mark the occasion by picking up stunning collections of classic comics One-Eyed Jack, Faceache, Marney the Fox, The Leopard From Lime Street and The Dracula File! Following the acquisition of the Fleetway and IPC Youth group archive from Egmont UK in 2016, the Treasury line has been restoring this vital, but largely overlooked, piece of British cultural history in order to introduce readers old and new to some of the best comics ever published. Through painstaking reprographics techniques, comics long-forgotten are being brought back into the light. And don't forget the exhibition of original artwork from the archive at Orbital Comics in London! HALF PRICE Alan Moore collections! It's been 35 years since the anarchic aliens D.R. & Quinch first burst onto the pages of 2000 AD - and to celebrate we're giving Earthlets 50% off Alan Moore collections in the 2000 AD webshop! The riotous D.R. & Quinch Have Fun On Earth by Alan Moore, Alan Davis, and Steve Potter appeared in 2000 AD Prog 317, cover dated 21st May 1983, and the delinquent duo quickly became icons of madcap teenage rebellion (with added thermonuclear weaponry)! Though they'll never grow up, to mark their 35th birthday the collection of their torrid tales AND two other collections of Moore's work are now half price in the 2000 AD webshop! Collected in its entirety for the first time, the complete Skizz features the original series as well as Jim Baikie’s full-colour continuation of Alan Moore’s extra-terrestrial masterpiece. When interpreter Zhcchz of the Tau-Ceti Imperium crashes his ship into a small blue ‘Hellworld’-class planet he is stranded in the polluted, hostile British city of Birmingham where he is befriended by a plucky young local girl. But from bad food to Prime Minister Thatcher’s government alien-hunters, danger is ever-present; this E.T. may soon be R.I.P.! Moore's Future Shocks are darkly funny and deliriously twisted tales of sci-fi terror, where nothing is what it seems - this thrill packed-collection features the art of many legendary names in the comics industry including Ian Gibson (The Ballad of Halo Jones), Bryan Talbot (Luther Arkwright) and Dave Gibbons (Watchmen). Also included are over a hundred pages of bonus material featuring dozens of complete stories scripted by Moore for 2000 AD. And don't forget - if you have the 2000 AD app for Apple, Android or Windows 10 devices you can easily get discounted digital products - just register for the 2000 AD webshop using the same log-in details, make your discounted purchases in the shop, and then download them on the app! Cover dated 13th May 1978, for six glorious months Starlord brought fresh new science fiction stories to readers and offered more colour pages and higher quality paper. Despite this, Starlord was soon folded into 2000 AD, with the series Strontium Dog and Ro-Busters making the leap to the older, scrapier title - the rest, as they say, is history! You can read a short history of Starlord here. To celebrate 40 years since the launch of 2000 AD's much-loved stable mate, we're offering 50% off collections of stories from Starlord's first issue - Ro-Busters, Strontium Dog, and Planet of the Damned. Get 41% off all Judge Dredd collections in print and digital from the 2000 AD webshop! He's been bringing justice to the mean streets of Mega-City One and beyond for 41 long years - and you can now celebrate Judge's Dredd's 'birthday' with 41% off collections in the 2000 AD webshop for 24 hours!! With a cover date of 5th March, 2000 AD Prog 2 featured the first case of the ultimate lawman of the future - Judge Dredd - as he took down the Judge killer Whitey, who was holed up in the old Empire State Building. 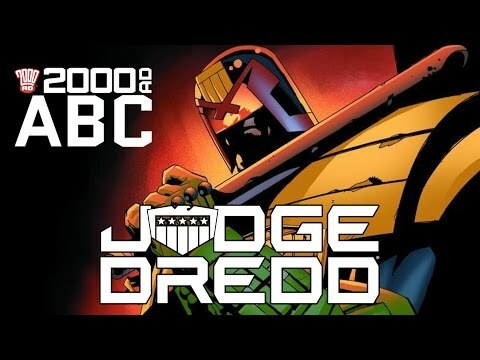 Little did readers know just how momentous this moment was for 2000 AD and for comics, with Dredd destined to become one of the most recognisable comic book characters in the world! Now, 41 years later, we're giving readers everywhere the chance to get some discount Dredd with a special birthday sale - get 41% off all Judge Dredd collections in print and digital from the 2000 AD webshop! Hurry, citizens - the sale ends at 12pm GMT on 8th March! APP USERS: don't forget - if you use the same registration details on our webshop AND the app for Apple, Android or Windows 10 then you buy discounted digital books in the webshop and, as well as getting them DRM-free, you can also download them to read on the app! Up to 50% off in our Halloween Price Slice! Grab a bargain from one of 2000 AD's top tales of terror! Discover cut-price tales to thrill, chill and unsettle with up to 50% off in our Halloween price slice! With the nights drawing in and the boundaries betwixt this world and the next thinning, now is the perfect time to sample one of the horror titles from 2000 AD - from fantasy frights to sci-fi scares, there's something for everyone at a price you can afford. 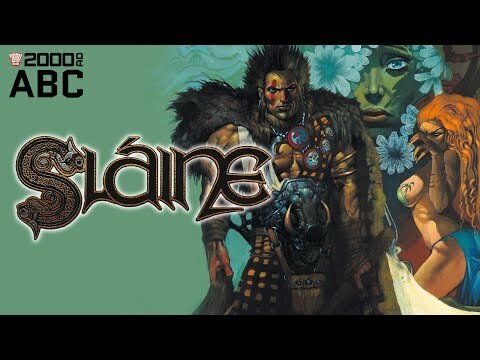 Half price sale on digital Sláine! 50% off the entire Celtic barbarian's saga in our webshop and apps! Digital editions of Sláine collections are now 50% OFF in the 2000 AD webshop and apps! To celebrate the woad warrior's birthday this month, until 24th August you can catch up with his ENTIRE saga in digital for just half price! Tir-Nan-Og - the 'Land of the Young' - is a violent world, home to warring tribes who worship gods both benign and malevolent. One such tribe is the Sessair, brave warriors of enormous skill and the best of them is a young barbarian named Sláine Mac Roth. Sláine is, among other things, a master of the 'warp-spasm' ‹ channelling the mystical power of the Earth through his body to become a mighty, monstrous berserker! Buy now DRM-free through the 2000 AD webshop or the zarjaz 2000 AD apps for Apple, Android, and Windows 10 devices! GALACTIC THRILL SALE - Progs and Megs just 50p each! All physical copies* of 2000 AD, the Judge Dredd Megazine, and 2000 AD Extreme Editions in the 2000 AD online store are now just 50p each! Yes, that’s right Earthlets - for just fifty of your British pennies (other Earth currencies are available) you can gorge yourself on Thrill-power from as far back as March 2001 - while stocks last! Go to the 50p back issue in the 2000 AD shop now! That’s 15 years of new Thrills from the Galaxy’s Greatest Comic as well as some stone cold classics such as Mean Team, Shako, Harlem Heroes, Meltdown Man, and Firekind! Grab yourself a bargain, Squaxx Dek Thargo - but you’d better be quick, once these bargains are gone ... they’re gone! 75% off in the 2000 AD shop 'til May 10! You can now get 75% off selected stock in our crash sale on the 2000 AD shop! Family by Rob Williams and Simon Fraser - reimagining the gangster story by adding superpowers to the mix! Red Razors by Mark Millar, Steve Yeowell, and Nigel Dobbyn - extreme and irreverent, Razors is a former psychotic and unstoppable criminal brainwashed into being a psychotic and unstoppable Sov Block Judge. Red Seas - Volume 1: Under the Banner of King Death by Ian Edginton and Steve Yeowell - the hardback edition of this swashbuckling story that mixes classic pirate tropes with magic, myth, and merriment! Robo Hunter: The Droid Files Volume 02 by John Wagner, Alan Grant, Peter Hogan, and John Smith with art from Ian Gibson, Rian Hughes, Chris Weston, and Simon Jacob - the original and still the best, Sam Slade (”That’s S-LA-Y-E-D to you!”) hunts down rogue robots in the future, with hilarious results! XTNCT by Paul Cornell and D’Israeli - in a future where the few humans left wage war using genetically engineered plants and animals, a crack troop of GM dinosaurs are abandoned by their creator and swear their revenge on ‘Father’ and all humanity. The Bendatti Vendetta by Robbie Morrison and John Burns - timeless European-style storytelling that mixes The Ipcress File with The Avengers by way of Robert Ludlum. For years, rumours have circulated amongst the law enforcement agencies and intelligence services of Europe about a mysterious order known only as the Bendatti. Where legitimate authority has no power, the Bendatti strike; not for justice but for retribution and vengeance! Necronauts by Gordon Rennie and Frazer Irving - a hunting adventure thriller in which Harry Houdini Sir Arthur Conan Doyle, Charles Fort and H.P. Lovecraft join forces to try and defeat an evil force which wants to enslave the human race. MAYDAY MEK MADNESS: 25% off digital A.B.C. WARRIORS titles! MAYDAY MEK MADNESS: 25% OFF DIGITAL A.B.C. WARRIORS TITLES THIS WEEKEND! A spin-off from Ro-Busters created by Pat Mills, Kevin O'Neill, Mike McMahon, and Brendan McCarthy, The A.B.C. Warriors are a team of war robots designed to withstand 'Atomic', 'Bacterial' and 'Chemical' warfare, and whether they’re policing the lawless frontier on Mars or saving the galaxy, the A.B.C. Warriors always succeed! Featuring a roster of the deadliest robots ever assembled, including war-weary leader Hammerstein, super-cool assassin Joe Pineapples, master manipulator Blackblood, the hulking Mongrol and his goo-tastic friend The Mess, disciple of Khaos Deadlock and the psychotic battle tank Mek-Quake, the Warriors go where humans fear to tread!